Good morning ... I was in the Commonwealth of Massachusetts over the weekend, which was delightful, but let me say here what I definitely could not say at the bar on Sunday night: LeBron James, LeBron James, LeBron James. 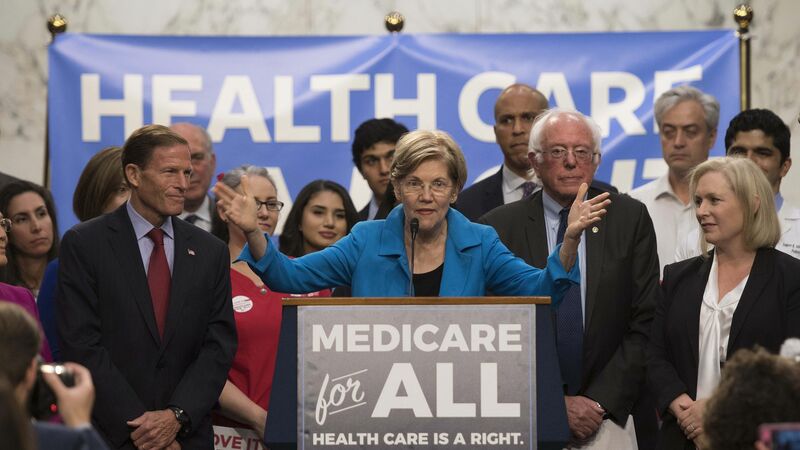 Candidates who support a single-payer health care system — or at least some expansion of government health coverage — are racking up wins in important Democratic primaries, my colleague Caitlin Owens reports. The big picture: Single-payer supporters are still a minority within the Democratic Party, but they've gained more ground this year than they've had at any time in recent memory. Democrats who support some version of "Medicare for All" or some sort of pathway to "Medicare for All" have won House primaries in Illinois, Nebraska, Pennsylvania and Texas — often beating out more moderate candidates backed by the Democratic Congressional Campaign Committee. More "Medicare for All" supporters are running in competitive primaries for competitive seats in California and New Jersey, which vote next week. Where it goes from here: Single-payer, or some form thereof, has been written off as an unserious proposal for a long time, even though it exists, for better or worse, in a lot of the world. That seems to be changing: Most of Democrats' leading 2020 prospects have embraced some version of the idea, and these down-ballot primary wins suggest that at least a big part of the Democratic base is getting there, too. Yes, but: A primary win only gets you so far. Republicans believe this leftward shift among Democrats will ultimately work in their favor, especially in the more moderate districts Democrats need to win in order to take the House majority. ICYMI on Friday, ProPublica had an excellent story about insurers, hospitals, financial incentives and the way patients get caught in the middle. The details: Michael Frank has spent 30 years working in health insurance, and was therefore surprised when he got a $7,000 bill for a partial hip replacement — 10% of the roughly $70,000 his insurer, Aetna, had paid to his hospital, NYU Langone. Medicare would have paid about $20,000 for the same procedure, and some estimates pegged the average cost for private insurance at roughly $29,000. Eventually, while Frank appealed the bills, NYU Langone sued him to collect. They ultimately settled. How it works: "You’d think that health insurers would make money, in part, by reducing how much they spend," ProPublica writes. "They just have to accurately predict how much the people they insure will cost. That way they can set premiums to cover those costs ... They can usually cover losses by raising rates the following year." My thought bubble: This is one of the problems that competition is, at least in theory, supposed to solve. When insurers are competing against one another for customers, they have an incentive to offer the lowest premium — and that's the source of their incentive to drive a harder bargain with providers. But when there aren't many insurers in a given market — and where consolidation among doctors and hospitals has reduced insurers' leverage — those incentives begin to break down pretty quickly. ProPublica's story takes place entirely in New York City. If you can't reap the rewards of market competition there, where can you? The Health and Human Services Department responded last night to the swelling firestorm over the number of undocumented children the agency has been unable to locate. “These children are not ‘lost’; their sponsors—who are usually parents or family members and in all cases have been vetted for criminality and ability to provide for them — simply did not respond or could not be reached when this voluntary call was made. While there are many possible reasons for this, in many cases sponsors cannot be reached because they themselves are illegal aliens and do not want to be reached by federal authorities. This is the core of this issue: In many cases, HHS has been put in the position of placing illegal aliens with the individuals who helped arrange for them to enter the country illegally. This makes the immediate crisis worse and creates a perverse incentive for further violation of federal immigration law." Democrats are looking to pin the broader issue of health care costs on Republicans, The Wall Street Journal reports. NPR breaks down both parties' health care pitches ahead of the midterms. Veterans' groups have high hopes for Robert Wilkie, President Trump's nominee to lead the VA, according to The Hill. Thad Kresho, a partner at PwC, predicts what the rash of health care mergers means for patients, in a Stat op-ed. What we're watching this week: Congress is out so, it's a slow one, but let me know what else is on your radar: baker@axios.com.